I’ve been on a healing journey for 5 years. I should be DEAD right now! A good friend sang this song at church today, and it blew me away! Listen Up. It’s for you too! I’m telling everyone I know God get’s the GLORY! Over that 5 year period little by little tools that have helped me heal have been brought to my attention. I have yet to find a place where many of them are listed in one space for easy accessibility. What am I healing from? Abandonment, rejection, grief, loss & trauma from my adoption experience and from LIFE. With little to no resources available for adoptees I was on my own in finding healing tools that would work for me. I decided I would share the tools I have found to help me in hopes these tools can enlighten and help other adoptees somewhere out there. I have come into contact with hundreds of adoptees all over the world who are seeking HEALING & FREEDOM. I ask them all the time, “What has helped you heal?” Sadly most of the time I hear, “Nothing!” Some are completely hopeless but I am here to give you a message of HOPE.I find it takes HOURS for me to share all the resources and most of the time I never can share them ALL. Now they are in one spot in hopes to sharing with MORE adoptees. I will share by stating the tool used and how it helped me. I will also share the link where you can find this information when applicable. Please share with your fellow adoptees and in your online communities. Please note I am not speaking for all adoptees as a whole. I say “Many of us” to eliminate categorizing all adoptees as having struggles. Some of us do and some don’t. It’s that simple. I’m sharing these healing tools for those adoptees that do struggle. I will also share, this is a lot. Please take your time and know that what has worked for me might not work for you. We all deserve healing and freedom & Its available to each and every one of us! Last but not least, if you are NOT an adoptee and you come across this page, feel free to apply these suggestions to any area of your life where applicable.These resources are definitely not limited to adoptees only. Please share with your communities because there are adopted people everywhere who could benefit. I know this is A LOT of information. Take baby steps. One at a time. Be easy on yourself. You are NOT Alone!- I hear this from adoptees from almost every single one that crosses my path. I felt this way most of my life. I am here to tell you today that YOU ARE NOT ALONE. That is one of the enemys # 1 tactics to make people feel alone. Well it is a lie. John 10:10 says, “The thief comes only to steal and kill and destroy; I have come that they may have life and have it abundantly”. There are an army of adoptees out here to support you! You just hadn’t found them yet. We are here. We aren’t going anywhere. Please believe you are not alone. Start using hashtage #adoptee and you will see. We are here, and God is ALWAYS with you! ❤ Which brings me to my next point. God- God and His word have been the biggest and greatest healing tool I have yet to discover. He get’s the #1 spot in my world and he always will. This means I believe GOD is who He say’s He is, and He’s going to do what He said He was going to do. Why you might ask? Let me share a little of what it costs to me ME. If you only knew all the places I’ve been in life. By looking at me now, YOU WOULD NEVER BELIEVE IT! I was abandoned by my birth mother when I was born, I was kept as her dirty little secret even from my own birth father. SHAME & REGRET I was raised in a home where I witnessed my adoptive mother trying to commit suicide in front of me multiple times. More Trauma She also tied us to chairs with dish towels, just to make us “behave”. Prescription pain pill addiction plagued this home. My adoptive mother had manic depressive episodes and deep rooted depression that resulted in me being mother-less even when I was adopted. My needs were never met, I was her caretaker my entire life. Until I escaped in 2005. This resulted in feeling like the mother daughter bond was always broken, because it was. I had no security or safe place. I was stuck in this home with no way out. I was angry, rage filled as a teenager and many of my adult years. Sexually abused when I visited my adoptive dad every other weekend by a older step brother. I was raped as a teenager. I ran away as a teenager, was in and out of alcohol and drug rehab, in group homes and learned very destructive patters at a very young age by being in the streets. I fought A LOT. Went to juvenile jail A LOT. I lost a baby at 15 because of the abusive relationship I was in. I was in many physically abusive relationships as an adult because I had no self love. I had a fractured chest bone, black eyes, a broken nose, stitches between my eyes, all from men. As an adult I was in jail for assault for fighting, I got a DUI and I was in the streets. I experimented with many drugs in my life, but alcohol was my thing. That DUI cost me $355.00 a drink that night! I hated the world and everyone in it. I hurt people and people hurt me. I depended on alcohol to take all the pain away for 26 years of my life. Partying was the only escape for me. [Only sharing because I want you to see I HAVE BEEN PLACES! DARK PLACES!] BUT GOD- God saved me! He has RESTORED ME! HEALED MY HURT! ERASED MY PAST! I live a brand new life now. 2 Cor 5:17 He wants the same for YOU! ❤ I’ve been living a SOBER LIFE on August 13, 2012. I have made the choice to receive my Hope and Faith from God and the Holy Spirit and HIS WORD. God has changed my life, forever! I gave my life to Christ in 2009 and it was the best decision I have ever made. That was the first most important step. Many of us have baggage from past life’s hurts. It’s critical to HEAL those hurts, no matter what they are BEFORE we will ever be able to live the happy prosperous life God has for all of us! We can put a band-aid on it but that’s a temporary fix. It always creeps back. Healing takes HARD WORK and DEDICATION. You have to go THROUGH the pain again but God can help you do this. The only way to receive this help is by believing in Him and receiving Him today. If you would like to receive Christ to live in your heart it’s the best decision you will have ever made. Healing and HOPE is possible. This is the ONLY way Healing is possible in my humble opinion. After this decision, God placed other tools, and resources available for me to work on my issues but receiving Him as my Lord & Savior is the #1 tool to move towards healing. It’s not about the religion, it’s about the RELATIONSHIP. Prayer- Prayer is simple. It’s communication with God. Sometimes pictures are painted where you have to pray a certain place and a certain way but God wants a relationship with you SO BAD, he will take prayer any way any time of day. Prayer is very important. We must give God thanks through our prayers, share our hearts desires, what we are believing for and pray for others and our world. There really is no right or wrong way. Prayer has been a major healing tool for me and IT WORKS! Here is an article I found extremely helpful and it’s from the legendary Billy Graham. This will give you some more details on how to communicate with God. How Do I Talk To God? Church Family- I know, I know.. All this churchy Christian advice. I promised I would tell you what has worked for me. ALL OF IT. So this is what has worked for me. These things have brought me healing. If you have never had a real true church family I promise you that you are really missing out. My church family is a VERY important part of my life and my kids lives. I promise I wouldn’t lie to you. I have spiritual mothers and father and spiritual brothers and sisters. They have been there when the crap hits the fan and came through when no one else was anywhere in sight. They have prayed relentlessly when crisis’s come and I have been able to build some of the most amazing life long relationships with them and that’s a GOD SEND. A church family is CRITICAL to healing. What’s your experience with a church family? Are you searching? What kind of church are you looking for? Ask for Prayer from Spiritual Warriors & Elders in Your Church- It took me years to do this. I was living in a great deal of FEAR. I guess I liked living in the pain too much? I don’t know but finally when my misery outweighed my FEAR I reached out to my spiritual momma. Deanie Cinnamon prayed over me that the spirit of unwantedness & shame be removed from my body. I had to BELIEVE this prayer was going to work. I had to RECEIVE IT. And it worked. Another time I was expressing an agony about a situation regarding my adoptive mom. She prayed the spirit of TORMENT be removed from my body. I had to believe it and it worked! When I went forward to receive prayer from my pastor I had to BELIEVE IT AND RECEIVE IT. I had to go forward, God was not going to chase me down. I share this because God gives us tools in the Bible and we all have the availability to use these tools to help hurting people! We all have the choice to go find our spiritual warriors and spiritual family and ask them to pray for us! Healing is POSSIBLE to those who believe. I believed it and it’s brought me GREAT HEALING! It can do the same for you! Praise & Worship- This might be way out of the field for some people, and that’s okay. Remember, I’m just sharing what has worked for me. I have my praise and worship music on 24/7 where ever I am at making the CHOICE to tune into the Holy Spirit. It is never turned off. Every room I am in, driving my car and even at work I listen to my Spotify Praise & Worship Playlist. It keeps the enemy at bay and he doesn’t stand a chance at getting into my thoughts as much as he would otherwise. This is a HUGE part of my life. I even play it when I go to sleep at night. Keeps bad dreams away. I promise you it has brought me LOTS of healing, and it works! Willingness & Surrender- If you truly want to heal you will have the WILLINGNESS to do whatever it takes to embark on a journey of healing. You will have the willingness to say “Okay God, I can’t do this on my own and I need your HELP! I surrender!”. We must all have the willingness or healing is not possible. For me, my pain became so great that I was desperate to do whatever it took to heal. I didn’t want to live with a broken heart my whole life. I didn’t want to be sad forever. I didn’t want to be angry. So I had the WILLINGNESS to do whatever God put in my path and I started asking for help. Then God put more tools in my life. In order to heal the pain we have to feel the pain. This is for every hurt, habit or hang-up in life. Are you ready for that? Is your misery that bad? Mine was! I am not ashamed. I needed HELP! Are you willing to do ANYTHING to heal? Is your pain that great? Faith- What is Faith? “Now faith is the substance of things hoped for, the evidence of things not seen” – Hebrews 11:1. Ephesians 2:8-9 makes it clear that faith is a gift from God, not because we deserve it, have earned it, or are worthy to have it. It is not from ourselves; it is from God. We must have Faith that God can and will heal our hurts. If we believe it we will receive it. If you are at a place with no faith, I am here to tell you I have faith for you and I will stand in the gap for you until you are at a place of Faith. I believe we can all receive God’s healing. But Faith is a pivotal step in this process. How’s your faith these days? Forgiveness- This is a major healing part of our journeys. I was angry at my birth mother, my adoptive mother and I absolutely despised 99% of adoptive parents I came into contact with. I had a deep seeded resentment against them. Why? For many reasons I won’t get into here. See Adoptees, Why Are You So Angry? for a look at why I and other adoptees might feel this way. I’m being TRANSPARENT here because I know there are other adoptees that struggle with some if not all of these things. I HATED ADOPTION and THE ADOPTION INDUSTRY. I still struggle with much of this today. Hey, I’m working on it and at least I can be transparent here. I never said I was perfect, only moving daily towards making progress. I am in recovery and healing for the rest of my life. I do know forgiveness has been a HUGE key factor in my healing. WE HAVE TO FORGIVE! Have you read the links where unforgiveness and bitterness is linked to CANCER and SICKNESS? Read This: The Deadly Consequences of Unforgiveness Not to mention the Bible commands us to forgive others as Christ has forgiven us. WE MUST FORGIVE. Here is an EXCELLENT and highly recommended article on Forgiveness and what it means. Acceptance- Have you accepted LIFE on LIFE’S terms? When we can’t accept things for what they are, we don’t truly process the emotions that go along with whatever it is we need to accept. In order to TRULY FEEL IT TO HEAL IT. I had to accept it. It HURT but this was a KEY STEP in my healing process. No matter what happened in the past I can’t change the fact that I was adopted, or anything else for that matter. I would give anything to be NOT adopted but that’s impossible. I spent most of my life HATING it and being ANGRY and still feel that way sometimes.But my hate was/is only hurting myself and I didn’t want to carry that burden anymore. Adoption is rooted and grounded in LOSS then comes GRIEF and TRAUMA. It happened. 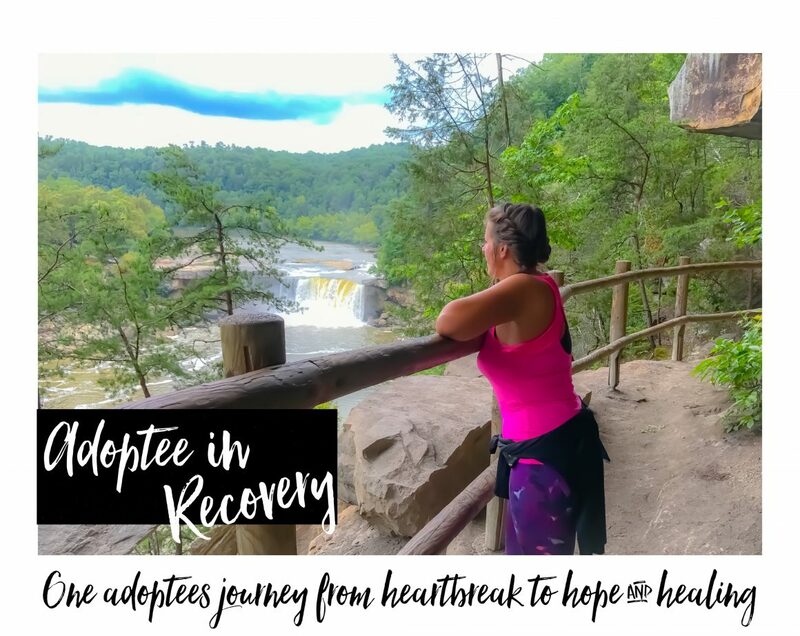 The sooner we can accept it is a part of our lives and there is NOTHING we can do to change it the sooner we can move forward to heal from the pain adoption has caused. This promotes healing. Where are you on this topic? Putting it on the SHELF- What in the world could this mean? LOL Well… I have a analogy I use. When something comes my way and I have no control over it and I can’t change it I take it and I visually put it up on the shelf. I do this daily, sometimes hourly! It’s an imaginary shelf don’t judge me! but for whatever reason the visualization of doing this HELPS ME A LOT. Why a shelf? Well the shelf is me giving it to God. I put it up there, it never gets filled up but it keeps going higher and higher and higher. I put “things” on the shelf ALL THE TIME! Things meaning issues, people, hurt feelings, decisions I can’t make, things out of my control, other peoples problems, etc. Maybe another analogy will work better for you? I needed an action step behind praying and giving things to God. This has been great healing for me. You should try it! Do whatever works for you? Kick it in the closet? Throw it out the window? Put it in the dresser drawer? We are not designed to carry burdens without God helping us. Giving things to God has helped me tremendously. Turning Anger into Something Positive- Anger is a natural response to many things in life. Grief, Loss, Trauma, Hurt, Pain can all cause anger. If you are quick to label an adoptee as an “Angry Adoptee” please stop. Many of us are hurting and we don’t know of the tools to heal or have resources available. Try being understanding and listening without judgement. You just might learn something. Many people think anger is a negative force, but I must share I believe it to be a negative force when we respond to anger in a negative way. We all have a choice on what we do with this emotion. It can be a very motivating force to create change, promote healing and to push towards goals and fixing problems in our lives. We must understand that anger isn’t always bad, as long as its used for a positive purpose. I was angery most of my life, and still do sometimes but I also never had anyone pouring into me trying to HELP ME use it for God’s glory. TODAY things are different. I had to pray and ask God to help me do something positive with this anger. Many things were birthed because of this prayer and step in my life. We must find out what God wants to do to turn our anger into something positive. It’s critical to our healing process. DNA Testing- The next time someone says “What do you want for your birthday or Christmas?” tell them a DNA kit from Ancestry DNA. I am telling you so many adoptees are finding out so many truths with DNA testing. I highly recommend it and found this to be an amazing avenue towards healing. I lived my entire life not knowing my nationality. I never knew my medical history. I had no DNA connections to anyone.Getting my DNA tested provided me with the answers my heart always desired. After you get your DNA testing done, you can download your raw data and upload it to Promethease and obtain a genetic testing report for $5. That’s IT! $5 can get you answers you have waited your entire life for. This brings major healing to find out our truth. Transparency- Being adoptees, many of us are groomed by society in general that we shouldn’t be sad or upset about our adoption experiences. Some of us are in denial. For many of us, there is no room for our grief, loss and sadness. Deep down many of us feel a deep unshakable sadness and a longing to know who we are and where we come from. As we reach our adult lives, many things can trigger us. Some adoptees aren’t bothered a bit, and some like me are bothered a lot. I have seen all variations. Holding things in and not sharing how you really feel is not healthy at all. Honesty and transparency on how we feel is critical to the healing process. Jeremiah 6:14 says “You can’t heal a wound by saying it’s not there!” Please believe this is true. You are not alone in your feelings and being transparent is the ONLY way you will be able to heal. Blogging/Writing/Journaling- This has been a major healing tool for me and I hope and desire it will be a healing outlet for you as well. We all need a “Safe Place” to share our feelings on how it feels to be adopted. We need our OWN space. It can be a notebook, a private online blog, a public blog, writing a book or a memoir. I highly recommend blogging. What has blogging done for me? It’s created a healing place where I can read back in time and see how far I’ve grown. I can share it with other adoptees and they will know they aren’t alone. I will see I’m not alone. It’s a space where no one can tell me how to feel this is important to adoptees! and they can’t interrupt me. They can’t silence me with silencer statements. It’s a place of control for me which is another topic many adoptees struggle with. I can control all things that go in and out of my blog and what I share and don’t share. I actually use all 3 blogging, writing and journaling as healing tools. I recommend WordPress as a FREE online blogging source and it also has a wonderful APP that is easy to use from your cell phone. Templates are easy. Please consider setting up your own blog. I also have a blog/journal that’s my communication with God. This is one of my most healing and freeing places. WE MUST WRITE! It’s a major healing source for many of us. See the Adoptee Blog Roll here on my page. I have listed over 6o adult adoptee bloggers and adding daily! You aren’t alone! Please Understand that If Someone Isn’t Adopted, They Don’t Understand Us- The quicker we can come to a place of acceptance of this the easier things will become. I remember back when I started my healing recovery journey. I was so frustrated that I would share my experience, pain, sadness, grief and loss and all I got from those around me was silencer statements like “Aren’t you thankful you weren’t aborted?” or “Aren’t you thankful she chose life?”. Adoptees understand this is adding insult to injury and avoiding the fact that we are TRYING to share a deep part of our lives but non-adoptees have no clue how they are hurting us. What’s a symptom of grief & loss? Anger, if the grief and loss aren’t acknowledged then it can come out in anger and rage. That said; if someone isn’t adopted they can’t understand us because there are too many dynamics and without the experience it’s impossible. Therapist that have years and years of training can’t truly understand us unless they are adopted. Adoptive parents or Birth Parents who “THINK” they know all there is to know about adoption can’t understand us. I am not saying they can’t TRY because there are some that TRY to sympathize and TRY to understand us. To fully understand us they would have to be one of us. I get great comfort in knowing that GOD understands us and knows our pain. It’s helped me be content with other’s not knowing or understanding. This brought me healing. Most people (not all) honestly don’t know what to say to us. They have been groomed by society that adoption is a wonderful thing and sometimes it can be but what they fail to acknowledge is that it is rooted and grounded in loss. Many non-adoptees don’t know what to say or what to do. People want us to feel better so without understanding they are hurting us further by not just listening, but offering unsolicited advice from a topic they simply can’t relate too they try to “FIX” us. I gave up many moons ago to try to get a non-adoptee to try to understand me UNLESS they are interested and WILLING to learn. There are very few! It’s sort of like me not knowing what its like to be divorced, because I have never been divorced. I have accepted this and forgiven them in advance. It was only hurting me to try to get them to understand, and acceptance they never possibly can has brought me healing. Back to the Womb Ministries- OMG OMG OMG! I can’t even begin to express how AMAZING this healing exercise was for me! My spiritual momma Deanie Cinnamon came to my aide one day in 2015. I was in a state of misery. I was seriously suffering from a GREAT mother wound and a HUGE broken heart regarding my adoption experience. I had this huge feeling of wishing I was never born and being angry I was, wishing I was aborted. THE PAIN WAS THAT GREAT! I had a feeling of unwantedness attached to me that I was born with due to my birth mother not wanting me, rejecting the pregnancy and handing me over to strangers to raise. I lived with this most of my life. I obsessed with wondering if my birth mother ever held me when I was born, what was the room like that day and if she named me. I wondered if she cried or if she was happy to get it over with. I know adoptees get it. Non-adoptees can’t possible understand. To them it’s just a “CHOICE” we choose to feel this way and ponder on the negative and past. In all honesty when traumas happen some people have to go through extensive therapy to work toward healing so until that happens for many people (not just adoptees) we feel like we are at a dead end and healing isn’t possible. Depression and Anxiety can set in ESPECIALLY when we don’t have any tools or the right ones that work for us. Nonetheless this HEALING TOOL was the most amazing experience. Ms. Deanie happened to get back from a training conference for 2 Hours to Freedom by Dr. Charles Kraft. She shared all the enlightening information with me about 2 Hours to Freedom and when I told her my feelings of the deep mother wound and I just couldn’t get out of this deep dark pit I was in she shared an exercise with me. This exercise is about 15 minutes long and I kid you not, after this exercise my life was changed! I don’t want to give it all away but I am sharing the link with you because hope and PRAY you are able to get the same healing as I did. Here is the link. Back to the Womb I also recommend purchasing Dr. Charles Krafts Books Here. He’s amazing and works a lot with healing. Please let me know if you watch the video and if it impacted you even a little bit. How did it make you feel? I will write about my experience soon in a blog post. How Does It Feel To Be Adopted Community- I will never forget a moment in October 2012 where I was in a small group setting and it was the very first time in my life I spoke out loud about my birth mother. As I let the words “Birth Mother” come out of my mouth I immediately began to weep and cry. Before you know it snot was slinging and I was a hot mess. I had never shared with other people how it felt being adopted and my heart break for the loss of my birth mother. Before I could finish saying what I was going to say an adoptive mom interrupted me and said loudly “YOU DON’T KNOW ADOPTION LIKE I KNOW ADOPTION!” I was floored. I was not in any shape to battle or even discuss things any further. I shut down and never said another word. I left in tears. Distraught because it seemed to me all the equations in the adoption “triangle” seem to be able to share their voice EXCEPT the ADOPTEE. Our voice is silenced, shut down, and not welcomed and we are labeled “Angry” or “An adoptee that just had a “BAD EXPERIENCE“.We are treated like perpetual children in the world for many reasons. Although this experience was extremely difficult for me it sparked me to create a safe place for adoptees to share how it feels to be adopted. This community has grown to close to 4000 “Likes” and its a very active online community. The unique thing about “How Does it Feel to Be Adopted” is that its a “ALL ADOPTEE COMMENTING ZONE” meaning adoptees are the only ones welcome to comment because we are the only ones who know how it feels to be adopted. The world can see and read our comments and how we feel which helps them LEARN from us, but they are no allowed to comment. This is the only setting I am aware of that is set up this way. It’s an open dialog for adoptees to ask other adoptees for support regarding certain topics regarding our adoptee journeys. It’s been a MAJOR source of healing and networking for adoptees all over the world. I know this because I have received countless amounts of messages, emails and communication with adoptees and they tell me how much this community means to them and how it’s helped them heal. The more we band together with those who “Get It” the more we understand we aren’t alone. If you haven’t joined this community yet PLEASE do so today! Share Your Story on the How Does It Feel To Be Adopted Blog- We have a blog just for YOU! I created this blog because there are places adoptees have to share their stories, but there are guidelines or some are turned away. I have felt many times that being turned away was rejection and I know that hits pretty hard for adoptees. I decided to create the How Does it Feel to Be Adopted? – Blog so no adoptee is turned away. Click that link and it will take you to the about section. You will find a few very minor guidelines and what I would need. The next step is to get to writing. Your story matters and you matter. This page is set up for YOU! Adoptee Books & Memoirs- As a suggestion consider making an investment in starting a collection of adoptee books and memoirs. I have done this and not only am I supporting my fellow adoptees but I am also reading each one, understanding and absorbing each one. Every single story I have read so far I can resonate with much of it. It helped me realize I’m not alone, I’m not crazy for feeling the way I do and it gave me a broader perspective of what many other adoptees experience, not just myself. Lots of healing doing this. Soon I will have Adoptee Books & Memoirs listed here. Therapy- I highly suggest therapy from a therapist who understands complicated grief, loss and trauma and disenfranchised grief. Reach out to Nancy Verrier and she’s quick to get back to you in reference to adoptee therapists in your area. Find Someone Who Will Listen Without Silencing You- I have found that through my journey most people who aren’t adopted can’t understand it nor comprehend it so when we share about it they don’t know what to say. That said, the quickest way to get out of the conversation is to either shut us down and most the time they don’t even realize they are doing it or they change the subject, or use silencer statements. THIS HAPPENS ALL THE TIME! But we all need that ONE PERSON or that ONE FRIEND that will listen without judgement. I had to research “Active Listener” because I came to a place where I desperately needed someone in my life who would JUST LISTEN! We don’t need anyone to try to FIX US. I’ve found many people listen with the intent to reply and we really need them to listen with the intent to learn. It’s so frustrating for adoptees because no one wants to talk about uncomfortable topics so we shut down and keep everything inside. When that happens we feel extreme feelings that are not good. Sadness, anger, rage, low self esteem because we feel we aren’t important and our pain doesn’t matter. Anxiety and depression can set it. PLEASE TRY TO FIND THAT ONE PERSON, THAT ONE FRIEND that will let you SHARE your heart without judgement. Ask someone if they will be your accountability partner regarding this topic. Of course if you could find an adoptee you would be winning all the way across the board, but sometimes that’s not possible. Twitter & Social Media- I have a list on my Twitter of over 500 Adoptees. Why? Because we MUST connect with those who understand us and can relate to our journeys Click Here= 500+ Adoptee List Every time I connect with another adoptee I am able to tell them”YOU AREN’T ALONE!” I was alone for most of my life in this journey and I don’t wish it on my worst enemy. The first adoptee I ever connected with online was Jessenia Arias You can find her on Twitter at @iamadopted I can’t even express how much it meant for me to find another living human being that GOT IT. She brought me out of my deep hidden shell and taught me it’s okay to feel the way I do. We all must do this for one another. Now, I am returning the Gift God has given me in finding Jessenia and reaching out to other adoptees all over the world. You can use hashtag #adoptee #adopted #adoption and connect with adoptees everywhere. You can find me on Instagram under @howdoesitfeeltobeadopted OR @pwishes. Social Media, especially Twitter are great places to connect with your fellow adoptees. Connecting with those who “Get It” is HEALING. Start A Support Group- You notice I say “Start A Support Group” vs. “Find A Support Group”. This is because adoptee support groups are very rare to find. I have searched all over my area and there are none. I haven’t even found any in my state. We have got to change this. God has given me a vision and I am in the process of activating it. He told me over a year ago that I was not only going to have an online ministry reaching out to adoptees all over the world, I was going to reach out to them right here in my own community. Adoptees Connect-Lexington, KY is in the process of being rooted right here on my own comunity. You don’t need any qualifications to do it. Being adopted in itself is enough. You understand things that no one else understands. Read this over and over and consider starting an all adoptee support group in your city. If I can do it, so can you! I believe in you! Searching for Birth Families- This can be a frightening process for some adoptees. I could go on forever about this topic, but I wanted to share that every single person on this earth deserves to know who they are and where they come from. There are resources available to HELP YOU search for FREE. Never EVER EVER pay ANYONE TO HELP YOU SEARCH! Not even any adoptees. There are FREE resources available. Please reach out to Priscilla Stone- Sharp on Facebook AND Join Search Squad on Facebook. I will get a link together for some more search resources because there are too many for this space. Never give up HOPE in finding your family. In order to heal we must know our TRUTH. Understanding or Circumstances- I made the choice to start researching what birth mothers, first mothers went through in the baby scoop era and the years moving past it. WHY? Because I wanted to understand WHY? Why did my birth mother make this choice? Why did she reject me after meeting her? Many of us spend our entire lives living in the unknown and many of us never have been given the TRUTH as to WHY. By researching adoption as a whole I was able to gain a better understanding. I was able to put myself in my birth mothers shoes to have compassion for her and the decision she mad way back in 1974. The book The Girls Who Went Away was a wonderful healing tool for me. It takes you through countless stories of birth mothers and the era, and how they felt relinquishing their babies. Many were stolen. Another site I recommend is [Birth Mother] First Mother Forum Healing happens when we are able to understand better. Adoptees On- My great friend, fellow adoptee AND sister in Christ Haley Radke started her very own podcast called Adoptees On. This podcast is truly a gift to the adoptee/adoption community. Consider reaching out to Haley and sharing your story. Also, listen to your fellow adoptees podcasts. Yours truly will be aired sometime in November. Remember, Sharing is healing. We must share our stories. Your story matters and you deserve to be heard. Write Letters to Your Birth Parents- This is a great healing exercise. Some of us don’t even know who our birth parents are, yet this exercise can still bring us healing. Share in the letter how their decision has impacted you and how you feel about it. Share your feelings no matter what they are, good or bad. You can share this letter with an accountability person, a close friend or family member you trust or a therapist. Generally, most adoptees don’t send the letters but it does do wonders just to get the feelings off our chest. I wrote one to my birth mother years ago. The emotions were overwhelming but that’s a good thing. Remember, in order to heal it we must feel it. Research Abandonment PTSD- Again, in order to heal I wanted to learn as much as possible of the impact on a baby when a mother leaves us. Please check both these articles out. I am sure there are many more. Abandonment from our birth mothers is a real live trauma. The more we understand it’s impacts the more we can heal. PTSD of Abandonment Part 1 AND PTSD of Abandonment Part 2 I’m positive there are more resources out there so RESEARCH Abandonment & PTSD! This is REAL for MANY ADOPTEES. Research Attachment Theory & RAD- Many adoptees experience both or one or the other. It’s pretty complicating but there are resources available to help you understand better and learn. Learning about these things can bring healing in understanding WHY we are the way we are. Process Grief & Loss- I wrote a blog post about this one time. Here it is. Grief, Loss & Adoptees This is an extreme critical part of our healing process. The hardest part for many adoptees is society doesn’t acknowledge we should even go through this process. WHY? Because the world only has room for the glorifying adoption stories. The fact is, that we have lost A LOT. We ALL need to grieve those losses. What ever that looks like to you. Everyone is different. It’s a process and it doesn’t have a time frame. If someone lost a husband or a wife in a car wreck or to a horrible disease we wouldn’t tell them “Okay, it’s time you get over that and move on!”. But people say it to adoptees ALL THE TIME, or label us as dwelling on the past. Let me tell you something no one ever told me. We lost not one ENTIRE FAMILY but TWO. Our maternal side and our paternal side. THAT’S A LOT OF LOSS AND A LOT OF PEOPLE! Take your time, be easy on yourself and know that it’s all a process and things will get easier. But remember, WE HAVE TO FEEL IT IN ORDER TO HEAL IT. What has the healing process looked like to me? Writing, Crying, Crying and more CRYING. Talking to those who care to listen, more writing and more crying. The key is not getting STUCK. The enemy has tried his hardest to keep me stuck but he’s a lier and I refuse to spend the rest of my life grieving my losses. It’s a PROCESS. I can’t say it enough. We move through it. Read my blog post I shared above. Research the grief and loss process. IT WILL HELP YOUR HEALING. Identify Your Triggers- This is something I’m working on as we speak in therapy. Not just identifying them but working on them. This is a must. It’s better when we have a better understanding of all the things I have listed in this post. When we have an understanding of WHY we are the way we are, the triggers don’t seem so bad. We are actually NORMAL for having these triggers considering what we have experienced by being abandoned & rejected. Identifying triggers is a great part of the healing process, working on them brings more healing. I suggest this for everyone. Get Involved in Adoptee Rights- Be an activist! We all deserve our OBC’s and we all should be on board for equal access for all adoptees all over to be able to have their OBC. Visit The American Adoption Congress and The Adoption ALARM Network to keep up to date with what’s going on. I know there are more sites out there. These just come to the top of my mind. GET INVOLVED. Use your pain for God’s GOOD. Purchase Dr. Dan Siegel – The Developing Mind- Dan covers neurobiological reasons that early trauma affects our behavior, emotional responses, and neurological connections. It is hard for adoptees to know that we have suffered a trauma, when that trauma happened so early in our lives, and most of the world doesn’t recognize that trauma. This book was an eye opener for me. It also touched on nature vs. nurture topic. Please purchase a used copy for under $5 here. The Developing Mind- Dr. Dan Siegel. Understanding brings healing. Being Adopted is A Piece of Who We Are, But Not All Of It- Its so easy to get consumed with “Adoptee Land”. It’s critical to our healing, peace of mind and our overall happiness that we can pull away from our adoptee lives sometimes. Yes, we will always be adopted but God has also called us to LIVE LIFE and live it abundantly. We have to learn to be on our healing journey but also take time away for our families, for our selves and those close to us. I am 110% guilty and I’ve had to learn that adoption is just a piece of who I am, not all of me.Pulling away is sometimes a healthy thing and we must all do it. Understand the Way You Feel is Normal for a Not Normal Situation- I remember the first time someone shared this with me, I was like “WOW!” So here I am sharing it with you. That’s right, being separated from our first families is NOT NORMAL. Our responses and how we feel are perfectly normal for experiencing such a trauma. Please believe this and be easy on yourself. Live Your Life- It’s so easy to get caught up in causes, our hurts, our pain. It’s easy to consume our lives with our struggles. I know first hand because I am in recovery and there is always work to be done on SELF! It’s a non stop journey of moving forward and improving ones self. I truly understand. I now look at my life as a pie. Why? Because I view my adoption experience as just a piece of the pie. For MANY years it was the entire pie. Why? Because I was in deep grief and loss processing through things I had never even touched before. That was a GOOD thing to go THROUGH it because remember we have to feel it to heal it. Do you see the letter “through” is KEY! I spent 4 years in that process and it’s 4 years I can never get back. I don’t regret it, WE ALL NEED TO DO IT in some form or fashion. It might take you 3 weeks but it took me 4 years. But God, he has shared with me recently that he’s ready for me to LIVE MY LIFE HE HAD INTENDED FOR ME ALL ALONG. The life he has intended for each of us. I will always be in recovery. I will always be healing. But it’s time for me to MOVE FORWARD and KEEP MOVING FORWARD. My Pastor & Spiritual Father Marion Dalton confirmed what God had put on my heart about a month ago. I went up to the altar for prayer and he prayed over me. He said many things but one of the things that stood out the most was, “God said the next PATH of your life is going to be NOTHING like the first part. NOTHING! It’s going to be a much easier path!” At that moment God gave me a vision of a beautiful path. This path was long and each side was filled with beautiful flowers in a bunch of greenery. Colors and green everywhere. It was the most beautiful thing I ever saw. I could see it very vivid. He continued to pray “YOUR BREAKING GENERATIONAL CURSES FROM FAMILY YOU DON’T EVEN KNOW!!! !” It was AMAZING at the word I got that night. I am sharing this with you because 1 week after this prayer I went to a park, on a walk. I turned the corner and you will never believe what I saw…. Unbelievable because this is the exact path I saw in the vision God gave me. SO at this point I have 2 choices. I receive the word or I reject it. WHO WOULD REJECT SUCH A GREAT GOD GIVEN WORD? Not me. Living 42 years with pain, agony, sadness, depression, fear, anger, hate and unwantedness from LIFE and ADOPTION, I am here to tell you I am ready to move forward with my life. I WANT TO LIVE MY LIFE and ENJOY the GIFT GOD HAS GIVEN ME IN MY LIFE. No person reading this is excluded from receiving the great Gift God has for you. Reach out to me. It’s time to go LIVE YOUR LIFE. Please come back and share with me what has worked for you and what is familiar to you about these tools. Have any of them helped you? Previous What is Adoptee Limelight? Pam has done an amazing job of sharing her journey with GREAT transparency. The tools she lists here will help EVERYONE achieve a deeper level of peace and freedom. So proud to know this beautiful lady!! !